You are currently browsing the Cindy's World blog archives for April, 2014. The city council of Greensboro is considering an ordinance that would prevent bus riders from wearing pants that hang too low. The ordinance would require waistbands no lower than three inches below the hip bones so this way skin or underwear won’t show. If you violate the ordinance you could be banned from riding public transportation for up to thirty days. Cities such as Fort Worth, Texas and Springfield, Ill., have already adopted such a policy. It’s believed sagging pants originated in prison – prisoners aren’t given belts because they can be used as a suicide tool, so their pants sag. I can understand the reasoning, but what I don’t understand is the person who wants to emulate prison attire. Why emulate a bad role model? Was it someone’s way of paying homage to a friend or relative in jail? Are we fresh out of good role models to emulate? Is there any logical reason why? I think I speak for all of us tired of this tasteless and disrespectful fashion when I say, “It’s about time.” There was a time when people cared enough to get embarrassed if their underwear showed; before low-rise jeans made the thong a necessity rather than an uncomfortable accessory. What type of underwear a person wore was a mystery, you had to look at a man and guess – boxers or briefs. Did he wear the heart covered briefs his wife gave him… just on Valentine’s Day or year round? How often did he change his underwear? Did he leave it on the floor or place it in the hamper? Did he wear underwear to bed or go commando? It was an unsolvable mystery. You had to look at a women and guess – 100% cotton or satin thong. Was she practical with buying the Hanes value pack or playful with buying the Victoria Secret lace thong? Did she suffer wedgie’s from her practical underwear like she did from her frilly thong? Did she ever mistake her thong for dental floss? It was an unsolvable mystery. One time at work, my husband’s pants split. He was embarrassed and when people stared, laughed, pointed and snickered – mortified. He came home to change pants and seek solace from me. Unfortunately, for him I was on the floor, doubled over in laughter, gasping for air that I couldn’t offer him comfort. He changed his pants and returned to work. I had a good laugh and that day his coworkers solved the mystery. My husband and I saw a play that was so bad we left during intermission. We would have left earlier but didn’t want to draw attention to ourselves and disrupt the play. I always feel funny being the first to leave any event so at a party I permit myself to leave only after someone else leaves first. Seeing the first person leave is like a signal for others to leave and then there’s a stampede toward the door. All at once fifty people are grabbing their coats, gloves, hats and bags and elbowing their way out the door. As a host, should you feel obligated to watch television with them? Should you feel obliga ted to feed them the turkey sandwich they request, after the kitchen has been closed for the night? Do you rub their feet as requested or do you request they lift their feet so you can run the vacuum under the couch? When it comes to unwanted guests I’m reminded of a line Tony Randall said in one of my all-time favorite shows The Odd Couple, “Never overstay your welcome or you’ll never be welcomed to stay over.” No truer words have ever been said. An article in USA Today talked about the “selfie obit” and how more and more people are writing their own obituaries because they don’t trust the newspaper or family to get it right. Type in “self obituary” on YouTube and you’ll find about 10,000 touching, shocking or amusing ones. Susan Soper (a former Atlanta newspaper editor) sells “ObitKits” that show people how to sum up their lives in ways meaningful to them. Writing your own obituary makes sense for the person who likes to control everything; they won’t have to come back and haunt the family member who wrote the obit, but left out vital information. The control freak can plan their entire demise from coffin to outfit and now – obituary. Will some obits be like an acceptance speech at the academy awards where the winner thanks everyone in their life? Or will “self obits” become like the last annoying Christmas newsletter nobody wants to read? Will it be the last hooray to rub in the noses of others as you list your lifetime achievements, making them feel inadequate? Every five years you should rewrite and edit your obituary to keep it fresh, keep it current. 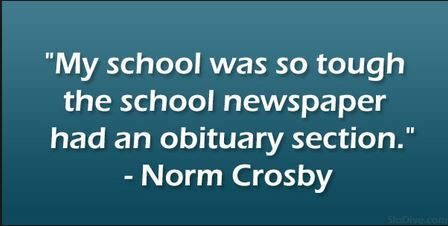 As for editing – do you think the ‘self obit’ can be edited? I don’t see why not. It’s not like the deceased will know. The wife and children may decide to print the truth and shred the glowing review the deceased gave himself; which leads me to my next question. Can a ‘self obit’ be contested like a will? Is it subject to change or is it written in stone? If enough people sign a petition can editing be done? If not – then my next question is – can the spouse publish a rebuttal? Would it be printed next to the obituary or on the Ed-Op page of the paper? I think the rebuttal maybe a lot juicier to read.